Despite the title of this marathon, the general thinking is that the Disney Renaissance ended with the release of Tarzan in 1999. The company tried to recapture the magic with movies like Treasure Planet and Atlantis: The Lost Empire, but the shift was dramatic. Pixar became the new leader during the 2000s and changed the genre with 3D animation. Disney recaptured much of this feel with The Princess and the Frog in 2009, but the must-see status was gone. I wasn't interested in Tarzan when it was originally released and didn't realize it was such a financial success. It earned more than $440 million worldwide and did better than its two recent predecessors. That's quite a haul for a film that isn't considered part of the company's recent heyday. Critics also gave serious praise to this release, and it earned an Academy Award for Best Song. Would my response match up to this lofty status? Let's check out the questions before I get overtaken by a horde of baboons! When an English couple is stranded on the African coast with their baby, they try to make the best of it and build a tree house. Sadly, the leopardess Sabor kills them and orphans the boy. He's saved by the gorilla Kala (Glenn Close), who names him Tarzan and raises him as her own. He tries to fit in with gorillas like Terk (Rosie O'Donnell) and struggles to gain the acceptance of the leader Kerchak (Lance Henriksen). As an adult, Tarzan (Tony Goldwyn) realizes that he's human when he meets Jane (Minnie Driver) and her father. They arrive on a peaceful expedition, but their guide Clayton (Brian Blessed) has nastier goals. 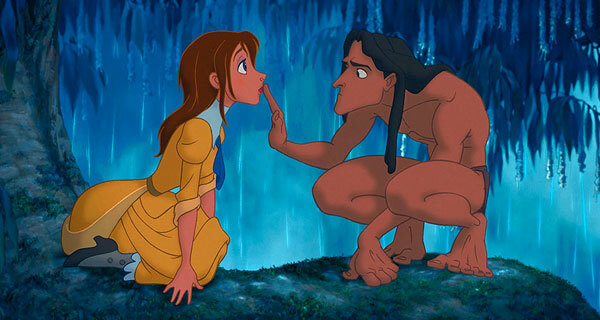 While the evil guy plans his next move, Tarzan has a potential romance with Jane. They come from different worlds, so it isn't clear if they have a real future. Is Tarzan on par with the most popular movies from the Disney Renaissance? I'm truly surprised to say that Tarzan is a movie that is worthy of being mentioned with classics like The Little Mermaid and The Lion King. It's very similar to the latter but still finds ways to provide an original experience. The combination of interesting lead characters, striking animation, and excellent songs leads to an entertaining movie. The opening sequence with Tarzan and his parents is handled remarkably to set up his life among the apes. We're immediately drawn into his plight as the lone human trying to prove his worth among the skeptical mammals. 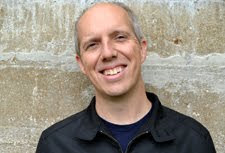 Clayton is a pretty generic villain, but he plays a relatively small role in the story. 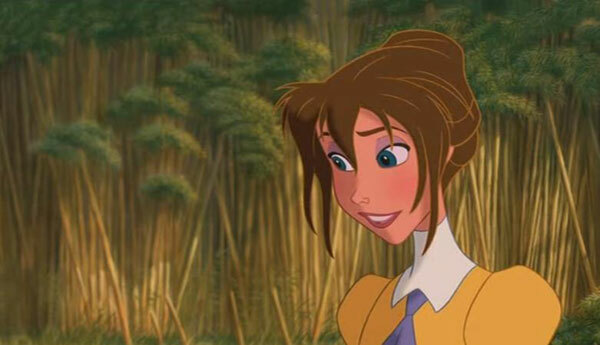 Jane is one of the most engaging heroines in a recent Disney movie. Minnie Driver's voice work is strong and makes us root for her to get a happy ending. The only major negative is the character of Terk, a painful sidekick for Tarzan. It's clear that she's set up with Tantor (Wayne Knight) as the Timon and Pumbaa of this film, but they aren't in the same ballpark. Rosie O'Donnell is grating and unnecessary but doesn't receive enough screen time to really diminish the success. Another positive element is the animation, which even improves on the attractive work in Mulan. The "Deep Canvas" 3D rendering technique provides a much deeper look that moves beyond traditional animation. It lacks the artificial look of much 3D animation while gaining the ability to show detailed backgrounds. 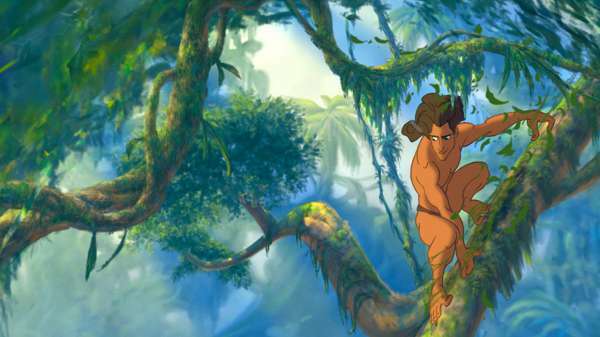 When Tarzan is sliding down the trees and working comfortably in his environment, it feels believable while still presenting a stunning world. Even though it differs greatly from what we see in modern Pixar films, there's still a timeless feeling to Tarzan that keeps it from being dated. Unlike Hercules, it doesn't feel stuck in the '90s and still provides a striking experience today. I may have a soft spot for the music of Phil Collins, but I enjoyed the songs. If you find him grating, then it's going to be a tougher ride. He shows up during the first few minutes and gets plenty of time. The big number is the Oscar winner "You'll Be in My Heart", which became a pop hit. "Strangers Like Me" is a fun upbeat tune that fits nicely inside this story. In most cases, Collins is an omniscient voice supporting the action. The music feels similar to Elton John's work on The Lion King, though it falls a bit short of those songs. Even so, it's still the strongest group of tunes from the three movies in this marathon. Elise was excited to watch this movie and hooked on the songs. Apparently she's a fan of the smooth grooves of Phil Collins. She enjoyed the music and some of the animal moments, but lost interest in the human story. At one point, she made it clear repeatedly that "Mulan is better than Tarzan." One interesting part of watching these movies with her has been noticing how certain parts could be scary for kids. The opening chase where Sabor tries to kill Kala and Tarzan may be harrowing for young ones. Elise handled it like a champ and wasn't scared, but it's clear that it wasn't her favorite part. 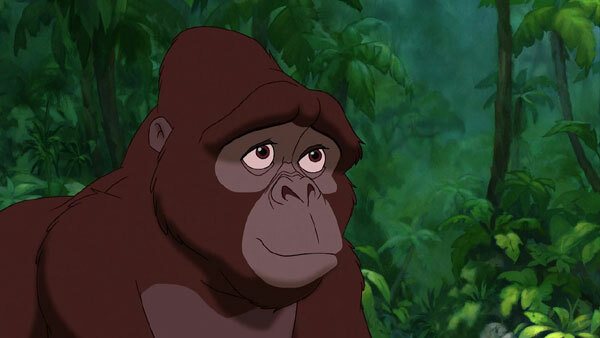 The death of Tarzan's parents was subtle enough to not be clear, but that type of loss could be tricky. I focused on what was happening on the screen and didn't dwell too much on the murder. Tarzan is easily the most well-represented of the three films at the Disney theme parks. It actually has its own full attraction with the Tarzan's Treehouse at Disneyland. Formerly the home of the characters from the Swiss Family Robinson, this walk-through spot in Adventureland includes presentations that call out moments from the movie. It's a nice place for kids to burn off some energy and offers a good view of the park. Fans of the main character might have a hard time finding him in the parks, though. His live show Tarzan Rocks! was replaced at the Animal Kingdom by Finding Nemo: The Musical in 2006. Although it was a box-office success, this film doesn't have the status of the big '90s movies. That makes the absence of more Tarzan appearances today more understandable. Next week, I'll explore a different sphere with mind benders, starting with Black Swan.